This document sets out TJM’s written evidence to the Joint Committee on Human Rights' Inquiry on Human Rights in International Agreements. 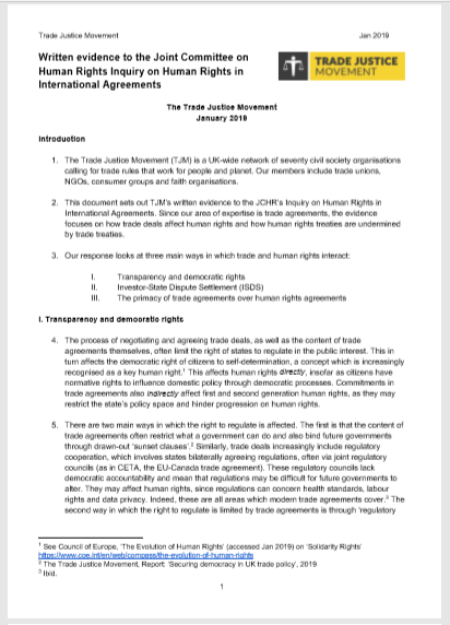 The evidence focuses on how trade deals affect human rights and how human rights treaties are undermined by trade treaties. Our response looks at three main ways in which trade and human rights interact: transparency and democratic rights; Investor-State Dispute Settlement (ISDS) and the primacy of trade agreements over human rights agreements. The process of negotiating and agreeing trade deals, as well as the content of trade agreements themselves, often limit the right of states to regulate in the public interest. This in turn affects the democratic right of citizens to self-determination, a concept which is increasingly recognised as a key human right. This affects human rights directly, insofar as citizens have normative rights to influence domestic policy through democratic processes. Commitments in trade agreements also indirectly affect first and sec­­ond generation human rights, as they may restrict the state’s policy space and hinder progression on human rights. Modern trade agreements often include Investor-State Dispute Settlement (ISDS) mechanisms, which allow investors to sue host states for any actions which harm their profits. This system has been heavily criticised on multiple fronts and has implications for human rights provision. ISDS uses a ‘parallel’ legal system of private arbitration courts, which unlike domestic courts, are not bound to recognise or take account of states’ obligations on human rights. As the UN’s Independent Expert concluded, ISDS does “not oblige the arbitrators to give priority to human rights treaty norms.” This means that a state could be successfully sued for enacting legislation to protect human rights. For example a challenge was brought by US oil company Burlington against Ecuador for failing to protect the company’s interests against violent attack from the indigenous community. The arbitration court did not take into account the fact that the Inter-American Court of Human Rights had already ruled that allowing oil extraction in that area violated the human rights of indigenous communities. The court was not bound to take into account these human rights concerns. Despite the narrow range of factors which taken into account in private arbitration, investors can sue for a very broad range of state action - even when actions contradict the public interest. Free Trade Agreements (FTAs) and human rights treaties are both subject to the Vienna Convention on the Law of Treaties. However, the tendency is for FTAs to have far higher levels of bindingness contained within the treaty, whereas human rights agreements often contain vaguer commitments with low levels of enforceability. Where there is conflict between international human rights conventions and human rights agreements, there is no guarantee that human rights will have primacy.